ColorBar Supplies are always the right choice. They deliver exceptional print quality and hassle-free label printing. 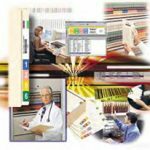 Designed specifically to work with ColorBar software, our supplies provide accurate color matching and uniformity. ColorBar labels will not yellow over time. Consistent whiteness prevents color shifts in your color coding. Special sheet construction reduces paper jams when printing. Stringent adhesive quality controls prevent problems with curling, peeling and printing. 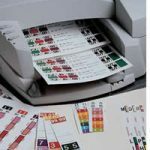 Choosing the right label - To ensure label printing quality, match your label stock to your printer. If you use a laser printer, it is very important to use a label specifically designed for laser printing. If non-laser stock is used, the adhesives may ooze out as stock passes through the printer rollers, damaging the printerï¿½s platen. Use Bright White label stock. ColorBar WaterGuardï¿½ labels are designed specifically to work with inkjet printers. ColorBar WaterGuard labels are made with a unique double coating to prevent ink runs, bleeds and fading. Even when submerged in water for several minutes, WaterGuard labels will not cause the ink to fade, run or bleed when handled. All adhesive products have a limited shelf life. We recommend that you purchase only the quantity that may be used within 12 months of purchase.